Our rope will hard to fray, break or come loose. It is extremely hard-wearing and provides excellent resistance for strength training. Perfect for cardio training, it will improve your endurance of shoulders, increase reaction time & metabolic rate. 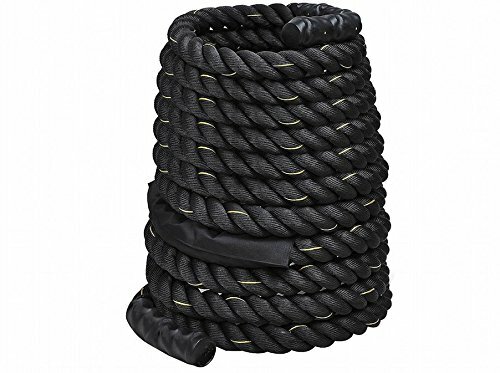 The battle rope is extremely hard-wearing and provides excellent resistance for strength training. consumption, the comparatively small muscle mass of the arms, make upper body exercise a greater challenge to your cardiovascular system than equivalent lower body exercise. Your heart has to work harder to deliver oxygen to those hard working muscles! This leads to higher cardiac output and oxygen consumption. It is perfect for boxers, mixed martial artists, swimmers, surfers, basketball, baseball, tennis players, or anyone looking forward to promoting their physical fitness to a new level. 100% Poly Dacron, Wear Resistant and Durable. Yellow Tracking Line, Convenient for Maintenance. 600D Oxford waterproof sleeve Protect the Rope from Friction and Fray. Heat Shrink Caps on the ends. High Tensile Strength. Build Stamina. Increase VO2 Levels. Improve Cardiovascular Health. Gain Lean Muscle Mass. Burn Fat. Strengthen Core Muscles.